The common interests of the Kenyan government and ICRISAT in improving the nutrition and income of smallholder farmers, involving youth in agriculture, use of information technology and involving private sector in agriculture were explored in a recent meeting between Mr Willy Bett, Cabinet Secretary, Kenya Ministry of Agriculture, Livestock and Fisheries and Dr David Bergvinson, Director General, ICRISAT. ICRISAT’s focus on improving nutrition is aligned with the ‘Beyond Zero’ initiative, spearheaded by the First Lady of Kenya, Her Excellency Margaret Kenyatta. 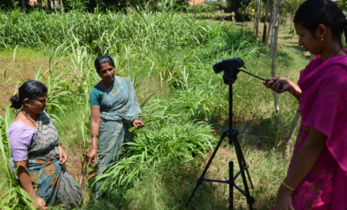 “We see tremendous alignment between the First Lady’s initiative and what ICRISAT does, around what we call Smart Food – sorghum, millets and legumes. We are very focused on creating awareness on nutritional diversity of these crops and promoting their utilization and consumption, so as to increase the nutritional status of both the rural and urban population in the country,” said Dr Bergvinson. The Beyond Zero initiative aims at creating awareness and raising funds to tackle issues that affect maternal and child health in Kenya. 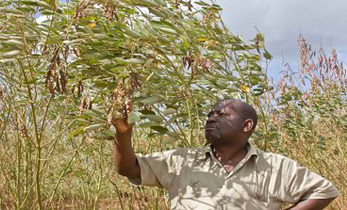 “We are calling them high value crops,” said Mr Bett, referring to the drought-tolerant crops. “The Ministry of Agriculture is also trying to promote these crops now because for a long time they have been referred to as orphan crops and we have now changed the name to high value crops. 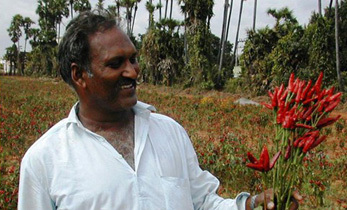 They are critical food crops that can eradicate hunger and poverty in our country,” he added. Dr Bergvinson gave the example of finger millet which has three time more calcium than milk. 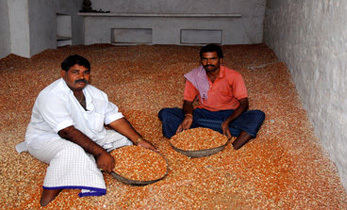 “It is one of the most important cereals we have on this planet. It’s especially important for young women in their childbearing years and for children in their first 1,000 days of life to have appropriate nutrition,” he said. 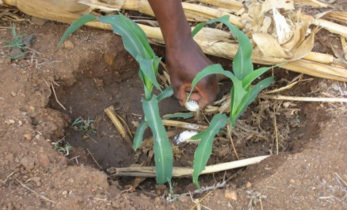 Farmers from Siaya county for instance, under an ICRISAT project, now grow finger millet instead of maize, earning three times more, thanks to an early maturing variety (80 days to maturity instead of 120 days). “I think if we could come up with a combined strategy then we will be able to convince Kenyans that this is the way to go,” said Mr Bett. Mr Bett agreed with Dr Bergvinson that introducing processing is the key to market development for these crops. 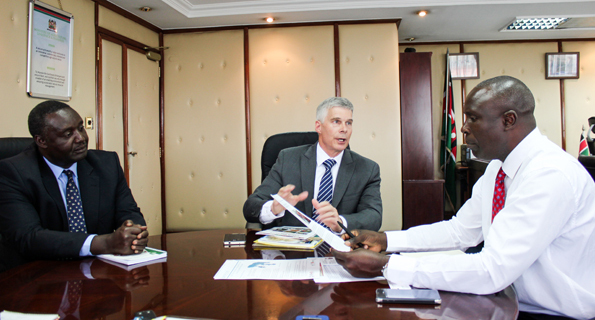 “We need to promote value addition in order to attract urban consumers,” Mr Bett asserted. Currently, under the Feed the Future Kenya: AVCD Program, ICRISAT is working to boost food and nutrition security of 110,000 farmers in Busia, Elgeyo Marakwet, Kitui, Makueni and Tharaka Nithi counties, as well as raising their incomes by 25%. The project seeks to increase yields of sorghum, finger millet, pearl millet, pigeonpea and groundnut and reduce post-harvest losses by 30%. 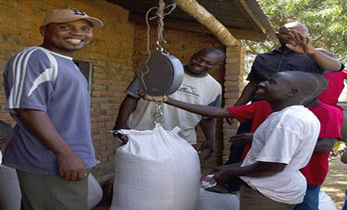 The project is seeking to partner with the Kenyan government to raise awareness about the nutritional value of sorghum and millets, in a bid to raise the nutritional status of women and children in the country. The meeting concluded with a resolution to develop a joint strategy for the Smart Food – nutrition behavior change initiative. ICRISAT has been associated with Kenya since 1981 with the Semi-Arid Food Grain Research and Development Program, largely funded by the United States Agency for International Development. ICRISAT’s office in Kenya is the regional hub for Eastern and Southern Africa overseeing other offices in Ethiopia, Zimbabwe, Malawi and Mozambique.